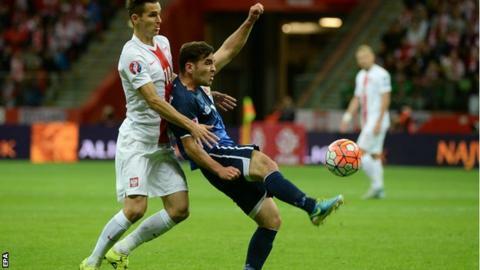 Jake Gosling: Gibraltar's answer to England's Wayne Rooney? While Wayne Rooney has being receiving plaudits for becoming England's leading scorer, another English-born player has been making international history of his own. Jake Gosling became the first ever Gibraltar player to score more than once at international level. His late strike against Poland in Monday's 8-1 loss was his second for his country and just their fifth in 14 international matches. "The goal was a really proud moment for me and something I'll never forget," said midfielder Gosling, 22, who is now Gibraltar's leading scorer of all time - with two goals. Gosling, who has played against nations such as Germany, Poland and Scotland, has come a long way in his career. His Gibraltar-born father was in the Royal Air Force and Gosling grew up in Newquay while his father was stationed at RAF St Mawgan. Gosling was on Plymouth Argyle's books until he was released at the age of 16 and then spent a year at Hartpury College in Gloucestershire. He impressed for Forest Green's reserves in a fixture against Exeter City and Gosling was then offered a deal by Exeter City. When Gibraltar became an international footballing nation in 2013 it was an opportunity that the midfielder, who now plays for Exeter's League Two rivals Bristol Rovers, could not turn down. "I was buzzing to get the initial call-up," Gosling told BBC Radio Cornwall. "I scored against Estonia on my debut and we got our first win against Malta in the game after. "Those first two games were unbelievable and I thought we were really good and could do well, but things have changed a bit since we've played better opposition." That might be a bit of an understatement. Gibraltar's first qualifying campaign for a major tournament- Euro 2016 - saw them drawn in the same group as World Cup winners Germany, as well as Poland, Scotland, Republic of Ireland and Georgia. They have conceded 46 goals in eight games, all defeats, and scored just twice. "It's definitely surreal," said Gosling, whose first experience of senior football came for Dorchester Town in the Conference South. "But at the same time you're on the same pitch as them and you want to do the best you can and test yourself against these opponents. "I grew up watching some of these players and thinking how good they were, but when I go on that pitch I try to prove to myself I can play at that level. "It's a very high level but I don't think I'd do myself any justice if I just went there to make up the numbers, I want to do well." So what now for a player that swapped shirts with Andre Schurrle after facing Germany? "We've got Scotland and Georgia in our final two games," said Gosling. "We'll be looking to get something out of the game against Georgia, and against Scotland we'll be trying to do our best. "Scotland might have a chance of qualifying against us, so they might bring a few fans over. That'll be a good game."